Praying Mantises are ambush predators; they wait for prey to stray into range and then lash out at incredible speed, catching and holding their victim with grasping, spiked forelegs. 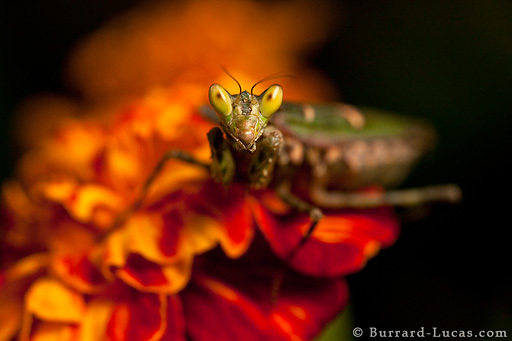 This mantis was waiting to ambush any bees or butterflies that might land on his flower. As we moved in with the camera, he spotted his reflection in the lens element and turned to check himself out! Copyright © 2019 Burrard-Lucas Photography. All rights reserved.